Your patio needn’t become out of bounds in the autumn and can even remain access all areas during the winter months. The enduring attraction of our verandas are their elegant construction, easy on the eye design and high durability. With many versions available they are also suited to many different types of houses and requirements. So whatever style home you live in, and ideas you have for it, our verandas can enhance your outdoor living experience. Our verandas stand out not only for their elegant design and seamless, minimal look but also for their versatility. A completely modular construction allows you to start with the basic roof and then add shading products, lighting and additional heating at any time in the future. You can even add side glazing elements and convert your veranda into a full glass room. 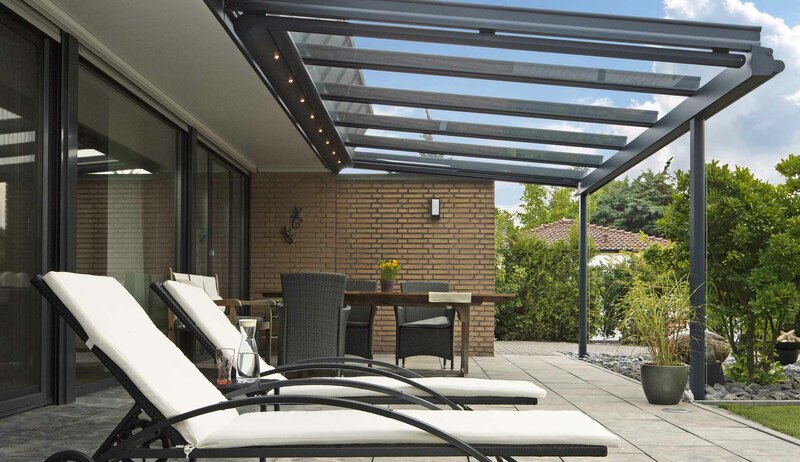 The high-quality, laminated glass patio roof provides weather protection all year round. 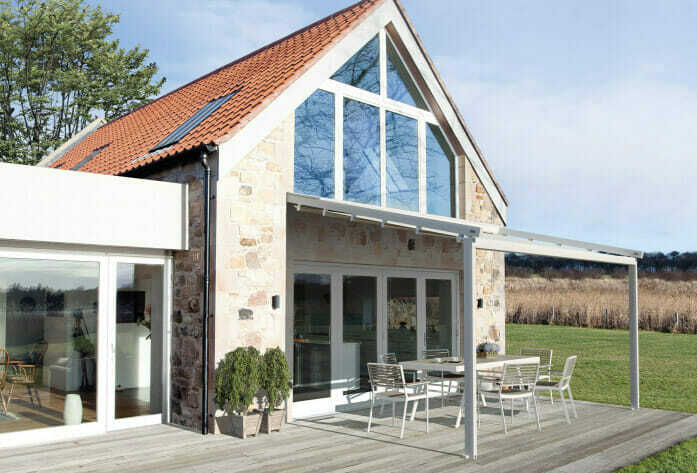 It is available with or without roof overhang both of which have fully integrated guttering which creates the minimal and contemporary finish. 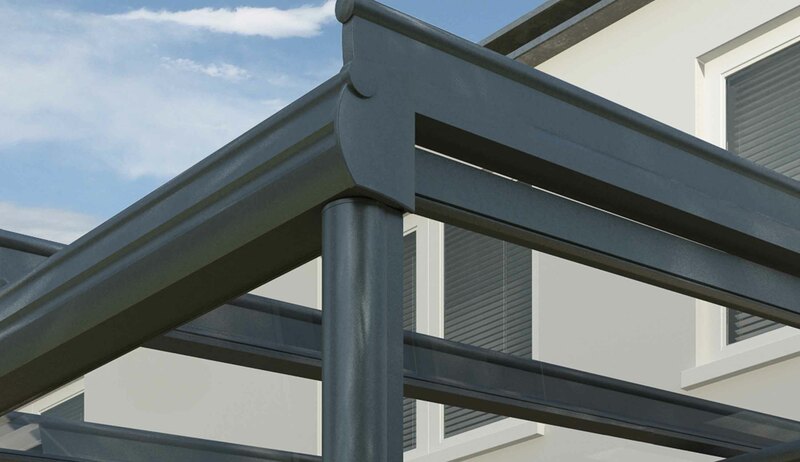 Our verandas are unique, thanks to the range of powder-coated colours and finishes included as standard. These include a huge range of colour options which are durable and long-lasting. 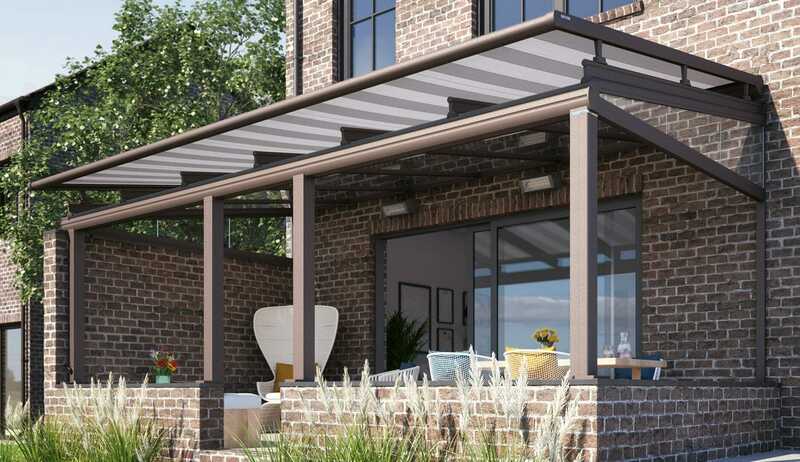 Our verandas come complete with many carefully engineered features and accessories. The elegant yet rigid construction is thought out down to the finest detail. Most fixings are concealed for a clean appearance and materials are corrosion-resistant. 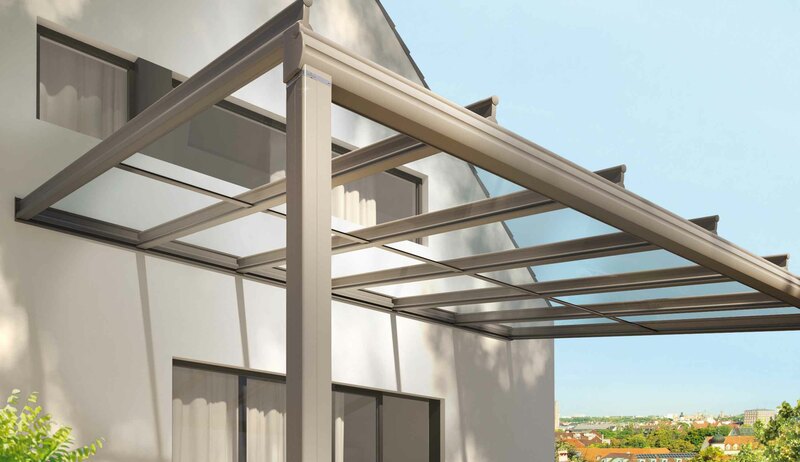 Our verandas are designed for use with high quality for high-quality laminated safety glass (LSG). Rainwater is efficiently drained away by the discretely integrated gutters and drainage outlets inside the post. Our verandas stand out for their exceptional stability and durability. These durable constructions are based on static calculations run by a certified engineering company. Our remote controlled LED lighting options extend the amount of time you can use your veranda in the evening. Lighting can be wall-mounted or integrated into the roof support to help create a warm, atmospheric light. How long do you guarantee your products? 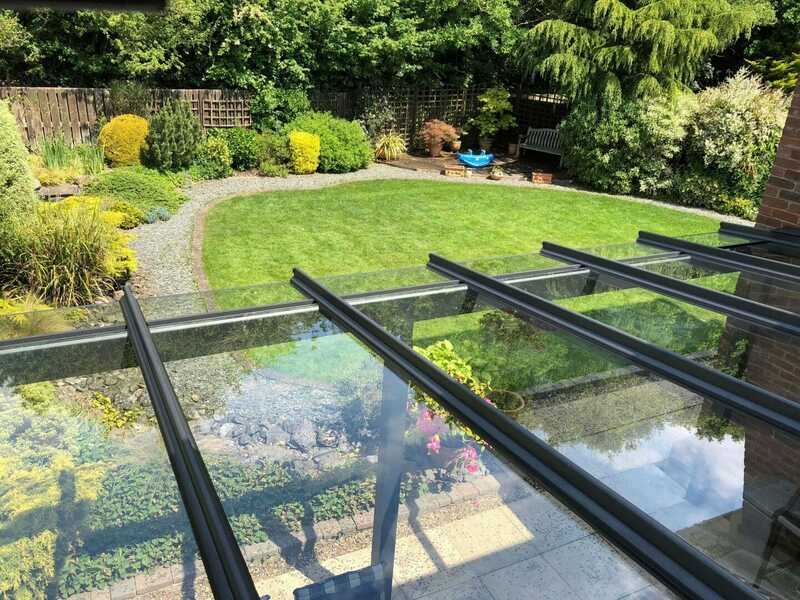 Our glass rooms carry a ten-year framework guarantee from the date of installation. Accessories have a five-year guarantee. This covers both manufacturing and installation defects. Terms and conditions apply. How much does a glass veranda cost? 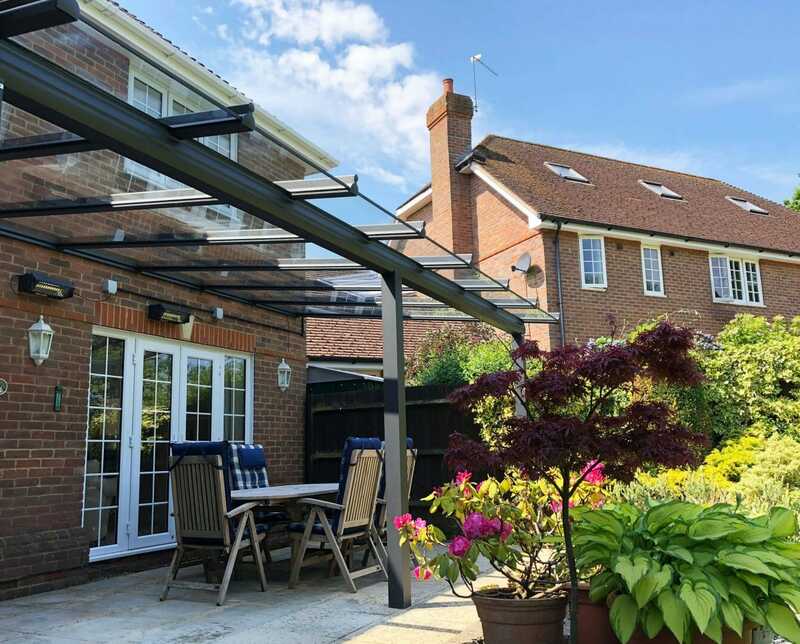 All of our verandas are made to your unique requirements and therefore we cannot provide prices without meeting with you. However, fully install verandas start from £7,000.00. 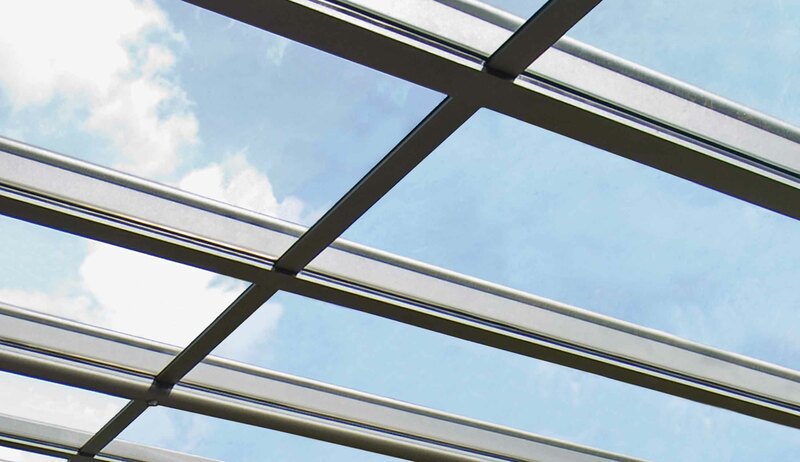 Our glass verandas carry a ten-year framework guarantee from the date of installation. Accessories have a five-year guarantee. This covers both manufacturing and installation defects. Terms and conditions apply. 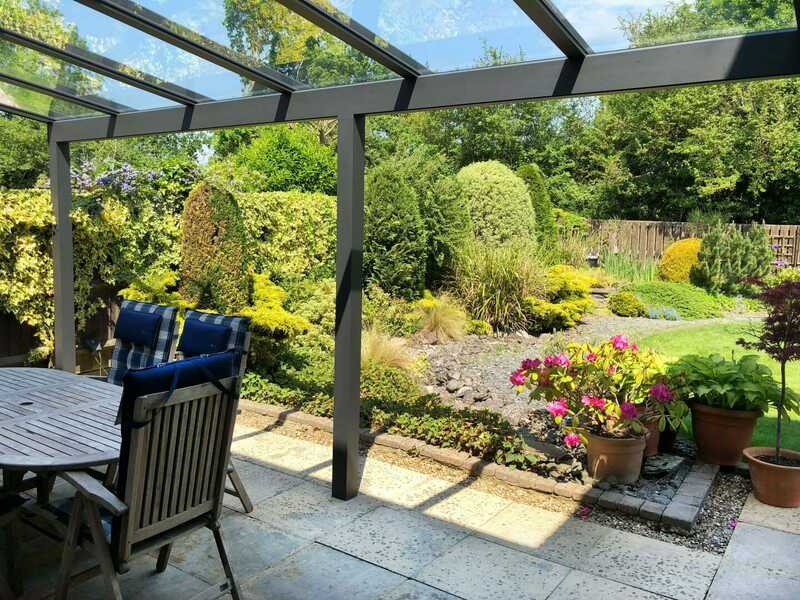 Is planning permission required for a glass veranda? Most properties in the UK will have permitted development rights so planning permission is not required for a glass veranda. However, we would recommend contacting your local planning department to check the rules for your area. If planning is required, we are more than happy to assist you with the application. Enjoying your garden does not have to finish at the end of the British summer (as short as it is). 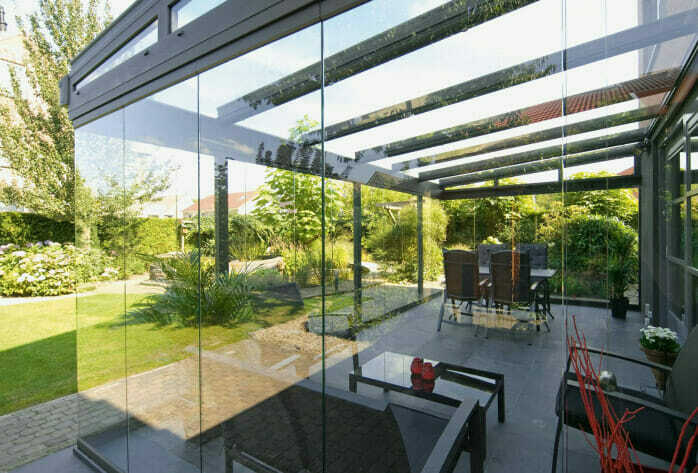 By choosing a glass veranda, it will provide you with shelter from the elements. The lighting and heating options will create a cosy and atmospheric space to enjoy all year round. For years we had dreamt of having a veranda in our garden so that we could dine and entertain outside, even in poor weather. The other companies that we approached either did not have the technology to give us what we wanted, or, even if they could, did not fully understand our vision. Martyn and the Outdoor Living Group did. One of the central design points was to create a way to invert the roof and make it pitch towards the bungalow, rather than away from it. This allowed the veranda to be made bigger, with a generous five metre projection out from the bungalow. This size gave the Carringtons the space and room they desired. It was a fusion of their vision and our expertise. 6.5m x 3.5m bespoke veranda including a roof overhang and dimmable heaters. We have been using our veranda for over 5 months now and it has been wonderful. Adding lights and heaters even meant that we could entertain there over Christmas.